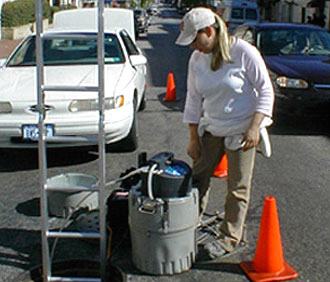 Andrea Taylorson-Collins, USFS Field Tech and CUERE Cooperator, checking on an ISCO water quality sampler deployed to a storm sewer in Watershed 263 in Baltimore. 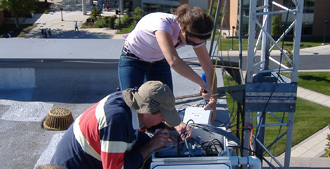 CUERE and Physics researchers deploying eddy covariance equipment on the roof of the Physics building. 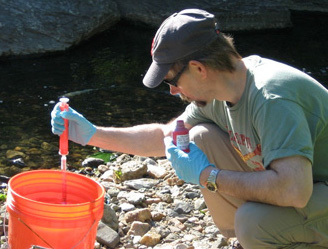 Robert Ryan, collaborator from Temple University, preparing to conduct a stream tracer test in Dead Run. 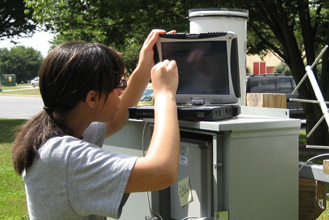 Roxanne Sanderson, CUERE Undergraduate Research Assistant, troubleshooting telemetry at a raingage site. 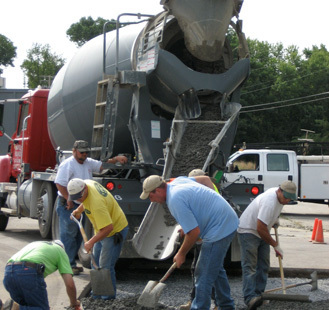 Pervious concrete installation at the TRC, organized by Stu Schwartz, CUERE Senior Scientist. CUERE’s mission is to advance the understanding of the environmental, social and economic consequences of the transformation of the urban landscape through research, conferences and symposia, support of university teaching programs and assistance to K-12 education. CUERE fosters interdisciplinary approaches to environmental science, engineering and public policy. The Baltimore Ecosystem Study is celebrated its 20th anniversary in 2018! Congratulations to Dr. Upal Ghosh, recently featured in the Bay Journal and other media outlets for his PCB work. C. Welty and co-PIs Andy Miller and Jon Duncan have received a Restoration Research Grant from Chesapeake Bay Trust.